Villa Paloma is one of the two sister villas set within the Picasso Villas complex. 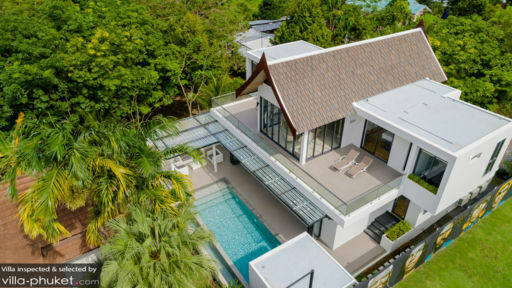 Located a skip away from Bang Tao Beach, the estate enjoys a tranquil, scenic environment, and makes a great option for restful getaways with friends and family. Drawing inspiration from 1950s icon Jayne Mansfield, the villa boasts a feminine style, a wall space dedicated to Mansfield’s movie posters (arranged in the same manner at her “Pink Palace” in Hollywood) and an indoor lounge fitted out with Mansfield’s 1950s sofa set. Containing a total of five bedrooms, the villa is ideally set up for travelling parties of ten. Five bedrooms are spread out across the villa. The ground floor contains two guest bedrooms fitted with twin singles, while both master suites (outfitted with king beds) are located on the upper floor. While all bedrooms are comfortably furnished, the master suites stand out with its Picasso prints and access to private sun terraces. A fifth bedroom, equipped with double bed and a private en suite accommodates two guests. It can be accessed externally from the outside of the villa. Take a dip in the sparkling pool, soak up the breezy Phuket vibes by the poolside or take in the tropical views from the upper floor terrace. The estate also features a private, FIFA approved mini-football 5-a-side pitch complete with floodlights. Professional coaching and training may be arranged for football enthusiasts. The 18m x 38m space also doubles up as a spacious venue for weddings, birthday celebrations and team building events. Villa Paloma combines contemporary design elements with 1950s retro chic. Inspired by Hollywood icon Jayne Mansfield, the villa features a wall space decked with Mansfield’s movie posters, as well as an upper floor lounge decorated with her original 1950s sofa set and clothed mannequin. The villa’s open plan living area is the focal point indoors. Large folding windows create airy, light-filled interiors, and the bi-folding doors open out towards the pool and al fresco dining area (complete with barbecue facilities). The indoor lounge extends out to include a dining area and open kitchen with breakfast bar. A private chef may be engaged for in-villa dining experiences or Thai cooking classes. Villa Paloma is a full-service vacation rental. The on-site team will readily assist with tour and travel arrangements. 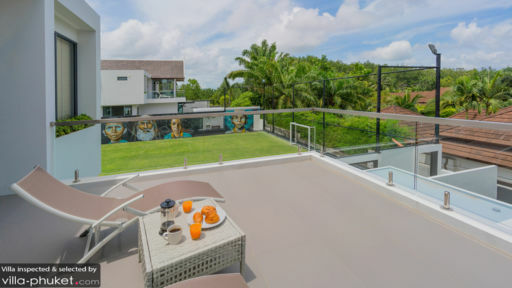 Villa Paloma is located along the western coasts of Phuket, close to Bang Tao Beach. The vibes here are quiet and laidback, and will suit vacationers looking to reside away from tourist hotspots like Patong or Kata. Bang Tao Beach, located 10 minutes’ drive from your villa offers ample options for beachfront dining. During the high season (November till February), the sea conditions are ideal for swimming and water sports. 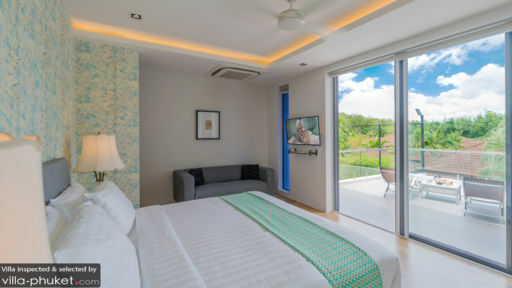 Located close by are attractions like Anthem Wake Park, Laguna Phuket Golf Club, Phuket International Riding Club and Wat Cherng Talay. Unwind and relax with top-notch spa rituals at places like Banyan Tree Spa Sanctuary or Angsana Spa Laguna. Planning a family day trip? Check out attractions like Khao Rang Viewpoint, Big Buddha, Wat Chalong, Sirinat National Park and Bang Pae Waterfall. Take your pick from dining options like Ceramic Kitchen Phuket, DeDos Restaurant or Toto Restaurant. To round out your evening with sundowners and live jazz music, stop by venues like Dream Beach Club and Siam Supper Club.